Inmates in the Isle of Man have volunteered to bring Christmas cheer to elderly people on the island. Food hampers are being delivered to 15 people in Jurby following cash donations from prisoners, staff and visitors. As well as helping to decorate the boxes, inmates contributed to the cost with cash from funds they had earned while serving their sentences. Deputy Governor Colin Ring said the response to his appeal was "wonderful". "Each hamper includes a Christmas card, handmade by prisoners," he said. "I am overwhelmed by the generosity of the prison and the desire to put something back into the community. "The response to this has been wonderful. It has been a very worthwhile appeal and something we hope to build on year on year." 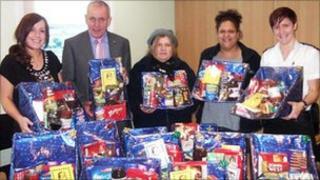 Last year, prisoners created 13 hampers for the local community. The 2010 batch were being distributed on Friday.